Scotland is a hugely popular holiday area and the country is actually very touristic. This of course presents plenty of opportunities for minibus hire companies, with consumers able to access a wide range of different services. Day Trips – All minibus firms will allow their vehicles to be taken for a day, with a lot of people choosing to explore other cities. This type of service usually comes without a chauffeur, although one can be included in most cases for additional cost. Nightclub Transport – The vibrant nightlife in Scotland means that several companies offer a nightclub transfer service. It should be noted that there are usually strict regulations attached to this service and consumers should be aware of them before purchasing. As the name suggests, Doig’s is based in Glasgow although the company are open to providing their hire services for other parts of Scotland. The firm have been in operation since 1991 and since then they have expanded tremendously, with their fleet now containing many different options. Their minibuses can seat up to 19 people although for customers with larger groups, they could turn to the company’s executive double decker coaches which have much larger capacities and include many sophisticated features. The company are available for any type of service and consumers can obtain a quote through the simple form on their website. 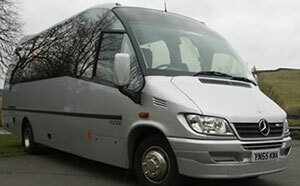 Hire Society cover the whole of Scotland and their coaches can seat between 8 and 75 people. The company make no secret of the fact that airport transfers is their forte, with drop-offs to Glasgow and Edinburgh airport being some of their most popular services. The company boast a long list of high profile clients and those customers wishing to make a booking with Hire Society can do through the simple online quote form. Aberfoyle Coaches have been in operation for over 80 years, making them one of the most experienced minibus hire companies in Scotland. Their fleet contain vehicles which can seat between 7 and 49 people, while they also run service buses to cover certain areas of Scotland. The company are professional in every sense of the word and provide a four stage form for customers to make a booking. Scotland is a country full of attractions and it is no surprise to see so many minibus hire firms vying for custom. Whether it be for the culture, sport or even hiking, Scotland has a bit of everything for everyone and is still a popular tourist destination for many British people. Even though it doesn’t benefit from the weather, Scotland still has a wealth of activities and this is how so many minibus hire companies are prospering. What’s more, with the country being so accessible through airports, this is another segment of the market which a lot of hire companies survive on.